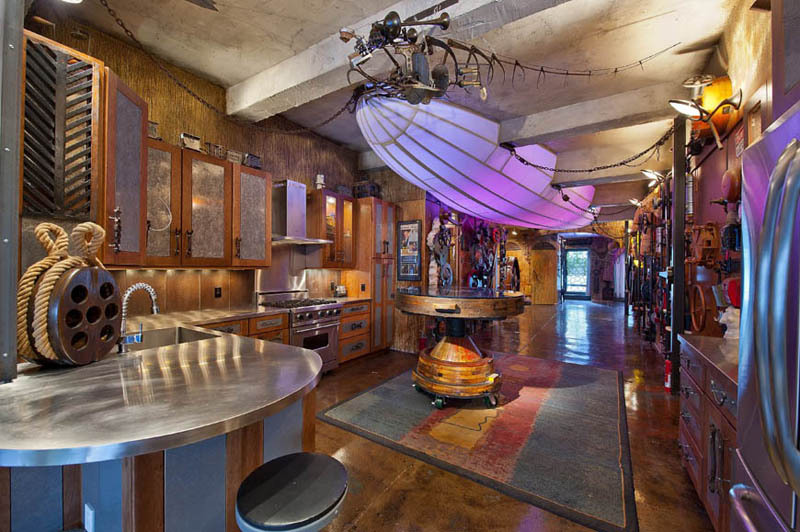 Located at 120 West 29th Street in the Chelsea neighbourhood of New York City, this 1,800-square foot steampunk themed apartment is the type of place you definitely check out if they have an open house. For those not in NYC we can only ogle at the gallery below. The place has been fully retrofitted in the steampunk aesthetic. Upon entering this semi-private building, you are greeted with a submarine style front entry, complete with keypad locking system and working porthole. The chef’s kitchen is furnished with high-end appliances and stainless steel countertops that allow for easy entertaining. From the custom finished concrete floors to the 32-foot zeppelin LED programmable light system, this apartment is a truly unique living space. Open the oversized glass sliding doors and step into your private 500-square foot southern facing terrace sanctuary. This large open loft is a one-bedroom with 2-bathrooms that can be easily converted into a 2-bedroom space with a home office. The building itself is a coop (granted the building only has 2 units) and the apartment is listed by Parul Brahmbhatt of the Core Group in New York City at $1,750,000.